Vinyl Shop Ticket Holder keeps job tickets, work orders, production schedules and inventory cards more secure and protected. Sturdy and economical, these Vinyl Shop Ticket Holder keeps job tickets, work orders, production schedules, inventory cards and more secure and protected. 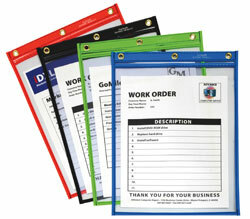 Great for two sided documents because both sides of these strong vinyl holders are clear. Welded, non-rip seams hold up in even the roughest environments. Punched hole at top for convenient hanging. 4 x 6 size. 50/BX. Learn about the wide variety of shop ticket holders at C-Line..